Thesis title: "Variable Wavelength Selection Devices: Physics and Applications"
Thesis title: "Computation of Quantum Confinement in Low Dimensional Physical Systems"
H. Xianyu, S.T. Wu, and C.L. Lin, “Dual frequency liquid crystals: A review,” (Invited article) Liq. Cryst. 36, 717-726 (2009). Z. Ge, S. Gauza, M.Z. Jiao, H. Xianyu, and S.T. Wu, “Electro-optics of polymer-stabilized blue phase liquid crystal displays,” Appl. Phys. Lett 94, 101104 (2009). L. Scolari, S. Gauza, H. Xianyu, L. Zhai, L. Eskildsen, T. T. Alkeskjold, S.T. Wu, and A. Bjarklev, “Frequency tunability of solid-core photonic crystal fibers filled with nanoparticle-doped liquid crystals,” Opts. Express 17, 3754-3764 (2009). H. Xianyu, S. Gauza, and S. T. Wu, “Submillisecond response phase modulator using a lowcrossover frequency dual frequency liquid crystal,” Liquid Crystals 35, 1409-1413 (2008). H. Xianyu, Y. Zhao, S. Gauza, X. Liang, and S. T. Wu, "High performance dual frequency liquid crystal compounds," Liquid Crystals 35, 1129-1135 (2008). H. Ren, H. Xianyu, S. Xu, and S. T. Wu, "Adaptive dielectric liquid lens", Optics Express 16, 14954-14960 (2008). X. Nie, H. Xianyu, T. X. Wu, and S. T. Wu, "Second and fourth harmonic frequencies in electric field-induced liquid crystal reorientations," Molecular Crystals and Liquid Crystals 489, 194-203 (2008). Q. Song, H. Xianyu, S. Gauza, and S. T. Wu, "High birefringence and low crossover frequency dual-frequency liquid crystals," Molecular Crystals and Liquid Crystals 488, 179-189 (2008). X. Nie, R. Lu, H. Xianyu, T. X. Wu, and S.-T. Wu, "Anchoring energy and cell gap effects on liquid crystal response time," Journal of Applied Physics 101, 103110 (2007). X. Nie, H. Xianyu, R. Lu, T. X. Wu, S.T. 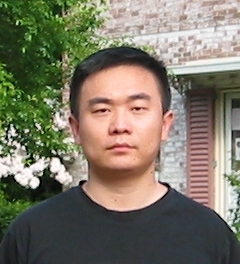 Wu, “Pretilt angle effect on liquid crystal response time”, accepted to IEEE/OSA Journal of Display Technology. H.-L. Zhang, H. Xianyu, J.-H. Liang, Y. Betremieus, G. P. Crawford, J. Noto, and R. Kerr, "Switchable circular-to-point converter based on holographic polymer-dispersed liquid-crystal technology," Applied Optics 46 (2), 161-166 (2007). H. Xianyu, T.-H. Lin, and S.-T. Wu, "Rollable multicolor display using electrically induced blueshift of a cholesteric reactive mesogen mixture," Applied Physics Letters 89 (9), 091124 (2006). Kengqing Jian, Haiqing Xianyu, James Eakin, Yuming Gao, Gregory P. Crawford and Robert H. Hurt, "Orientationally ordered and patterned discotic films and carbon films from liquid crystal precursors," Carbon 43 (2), 407-415 (2005). J.L. Kaiser, R. Chevallier, J.L. de Bougrenet, H. Xianyu and G.P. Crawford, "Chirped switchable reflection grating in holographic PDLC for wavelength management in optical communication systems," Applied Optics 43 (32), 5996-6000 (2004). H. Xianyu, S. Faris and G. P. Crawford, "In-plane switching of cholesteric liquid crystals for visible and near-infrared applications," Applied Optics 43 (26), 5006-5015 (2004). J. Qi, H. Xianyu, J. Liang and G. P. Crawford, "Active U-turn electro-optic switch formed in patterned holographic polymer-dispersed liquid crystals," IEEE Photonics Technology Letters 15 (5), 685-687 (2003). H. Xianyu, J. Qi, R. F. Cohn and G. P. Crawford, "Total-internal-reflection mode in holographic polymer dispersed liquid crystals," Optis Letters 28 (10), 792-794 (2003). G.-N. Zhao, H. Xianyu, J. Song, X.-B. Li, S.-Y. Ren, Size and shape dependence of the lowest conduction band states in GaAs quantum dots, Acta Physica Sinica-Overseas Edition 8 (11), 845-852 (1999). 1. H. Xianyu, Y. Zhao, S. Gauza, and S. T. Wu, “High Performance Dual Frequency Liquid Crystal Mixture,” International Display Research Conference 2008, Orlando, Florida (November 2008). 2. H. Xianyu, Q. Song, S. Gauza, and S.-T. Wu, "Large Negative Dielectric Anisotropy and High- Birefringence Liquid Crystals," SID Symposium 2007, Long Beach (May 2007). 3. H. Xianyu, T.-H. Lin, and S.-T. Wu, "Electrically-controllable multi-color reflective display using a single cholesteric liquid crystal cell," Americas Display Engineering and Applications Conference, Atlanta (October 2006). 4. H. Xianyu, T.-H. Lin, and S.-T. Wu, "Rollable Reflective Multicolor Cholesteric Displays," International Display Research Conference 2006, Kent (September 2006). 5. H. Xianyu, G. P. Crawford, and S. Faris, "In-Plane switching of cholesteric liquid crystals," 7th Asian Symposium on Information Display, Singapore (September, 2002).